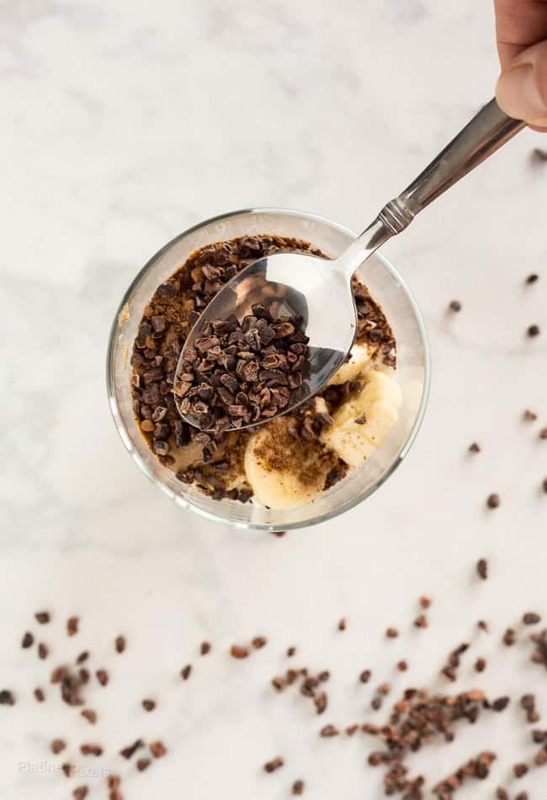 Want a breakfast that reminds you of a decadent dessert, but is wholesome, gluten-free, full of protein and healthy fats? Look no further than these Gluten-Free Chocolate Almond Butter Breakfast Parfaits. Plus tips for making them ahead of time as an on-the-go breakfast. It’s a wonderful thing when your breakfast is almost like a dessert, but totally healthy. 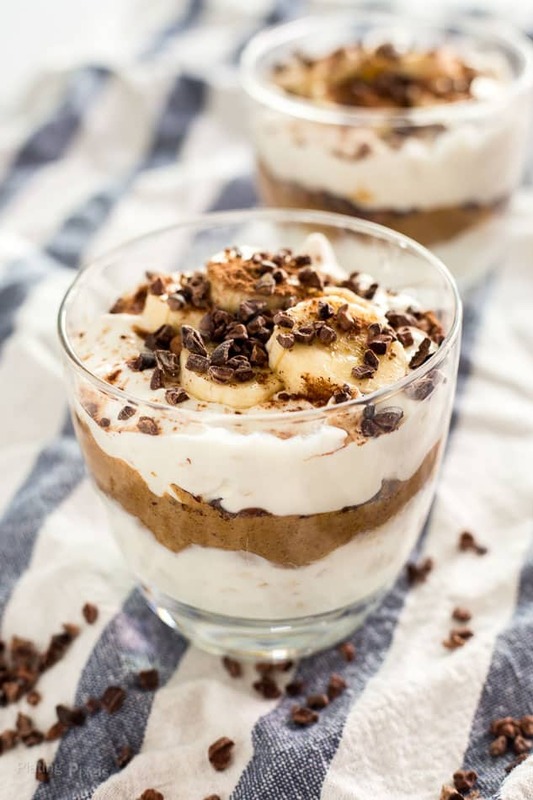 These Chocolate Almond Butter Breakfast Parfaits could even qualify as an ideal after dinner treat or better-for-you snack. With just a handful of ingredients and only minutes minutes of prep, it just may be your go-to breakfast. What is a breakfast parfait? A parfait is typically a dessert that consists of layers of ice cream, custard or something creamy layered with fruit in a glass. I’ve lightened them up to create these Almond Butter Breakfast Parfaits. Instead of sugary cream, high-protein Greek yogurt is layered with banana slices and almond butter to make simple breakfast parfaits. It’s a complete breakfas in one and also portable. Speaking of wholesome breakfasts, I’ve experimented with overnight oat recipes, including these Apricot Almond Butter Overnight Oats, and enjoy the make ahead convenience as well as variety of options. Making breakfast parfaits is quick and easy. Here’s a few tips and suggestions to make the best breakfast parfaits. To assemble: Simply layer yogurt with desired fruit, add-ons and toppings in a glass or container. For this recipe I suggest almond butter, old fashioned oats, cocoa powder and cocoa nibs. Use Greek yogurt for extra protein and thick, creamy layers. If yogurt is too thin, fruit and add-on may sink through layers. Flavored yogurt is optional. Can use a vanilla or other flavored Greek yogurt for extra sweetness, but it will add a lot of sugar to recipe. Prep ahead for on the go breakfast: if you don’t have a lot of time in morning these are great for portable breakfasts. Make them the night before, but be sure to not have banana slices on top layer or they will oxidize. Assemble in a portable container before bed and store sealed in fridge. 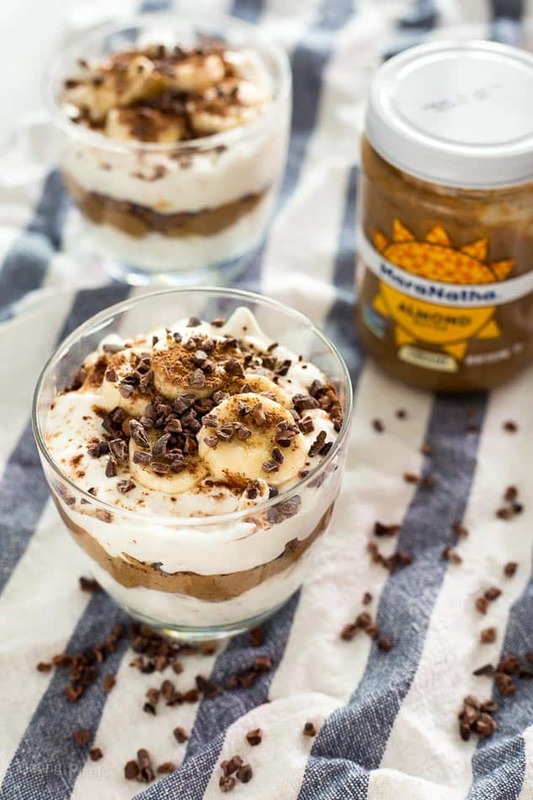 MaraNatha Almond Butters add plenty of wholesome flavor to these Chocolate Almond Butter Breakfast Parfaits. It’s the perfect way to enjoy the great taste and natural goodness of almonds—without the need to stir. It’s made from the finest heart-healthy California almonds, roasted and double-ground to a velvety texture. Try it in recipes such as baked good, breakfasts, sandwiches or even right from the jar. 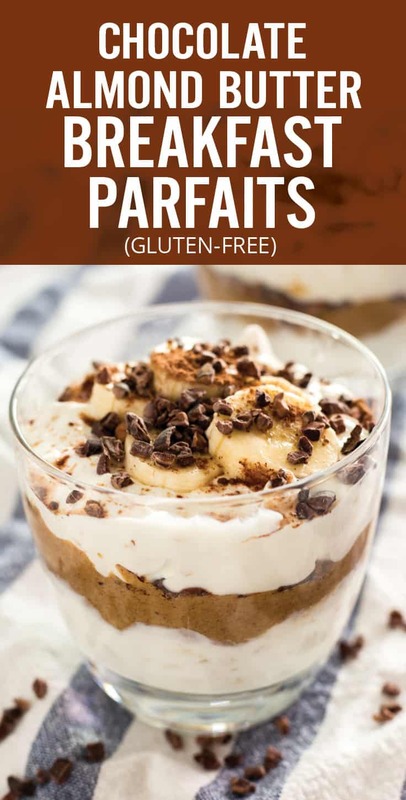 These easy Gluten-Free Chocolate Almond Butter Breakfast Parfaits are like a decadent dessert, but wholesome, gluten-free, full of protein and healthy fats. Spoon ½ cup yogurt each into 2 small glasses or jars. 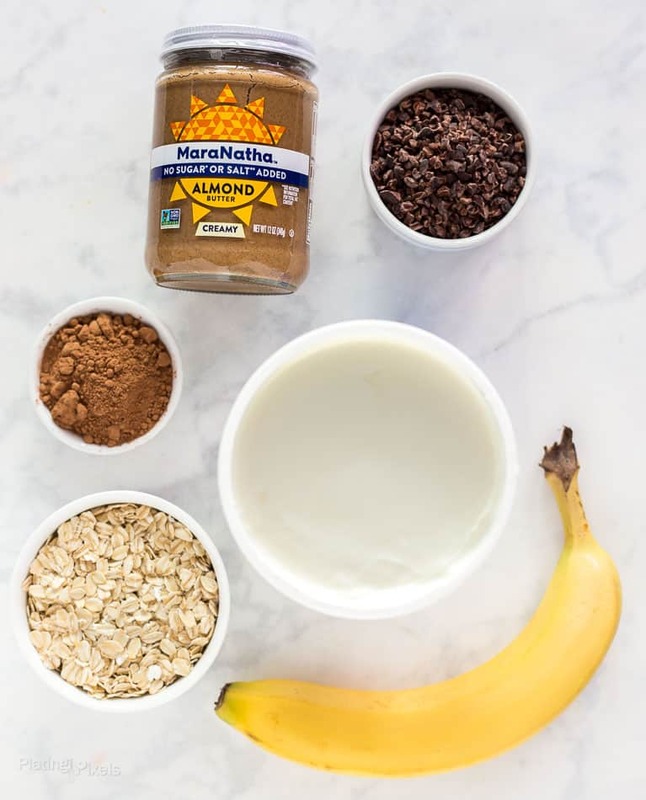 Top each with half of the banana slices and 1-tablespoon almond butter. Sprinkle with half of cocoa powder and nibs. Add another layer with rest of yogurt, then top with remaining ingredients. Flavored yogurt such as vanilla is optional, but will add a lot of sugar to recipe. Prepping ahead will also help soften the oats a bit, but I prefer the extra texture.